SEOUL, Oct. 23 (Yonhap) — South Korea may have to pay around 200 billion won (US$175.9 million) annually for transit fees to North Korea if it imports Russian natural gas via a trans-Korea pipeline, an estimate by the state-run gas firm showed Tuesday. The Korea Gas Corp. (KOGAS) calculated the transit fees at the request of Rep. Kwak Dae-hoon of the Liberty Korea Party, as the long-sought-after project has reappeared amid a mood of rapprochement on the Korean Peninsula. The gas company estimated the annual transit fee for North Korea at 180.4 billion won under a premise of paying $2 for pumping 1,000 cubic meters of liquefied natural gas (LNG) every 100 kilometers. The calculation was based on Gazprom’s comparable contracts with Ukraine, Belarus and Slovakia under a volume rated system. The cost could rise to up to 222.1 billion won if South Korea pays 5 percent fees on gas equal to 7.5 million tons from Russia’s Far East to South Korea via North Korea for a period of 30 years. “Once international sanctions on North Korea are lifted in the future, we will decide whether to push for the trans-Korea natural gas pipeline project after reviewing its feasibility, stability of gas supply and diplomatic and security issues,” KOGAS said in the report. South Korea, the world’s third-largest buyer of natural gas, has sought to stably bring in fuel at cheaper costs for the past 20 years, but such efforts have not materialized due in part to security tensions on the peninsula. 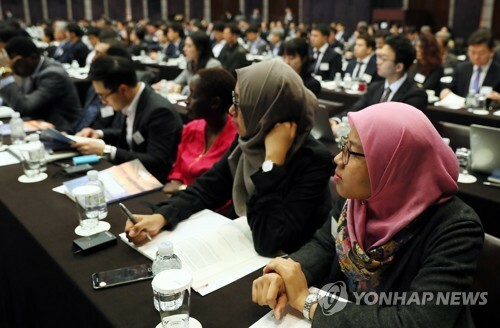 The project is now part of Seoul’s “New Northern Policy,” which is aimed at expanding economic cooperation with Russia in energy, transportation and various other areas.